Since the beginning of Järva DiscGolfPark in 1995, the course has been the place for numerous big Swedish and international events. The first year of Järva also marked the last year for the big Swedish event Kvarngolfen. Kvarngolfen was played in the nearby city Jakobsberg between 1986 and 1994 and at Järva in 1995. Mats Löf started the event and was the TD for most of the years. Jonas Löf, among others, formed the staff of the event. In 1996 Stockholm Discgolf Open moved to Järva DGP and it has been played there for 18 consecutive years. For 17 years before that the SDGO was held in other parts of Stockholm. Since 1999, Järva Open has been held at the Järva DiscGolfPark, and maybe in the future this event will take over the well-established “SDGO” name to continue the long annual tradition of the tournament. 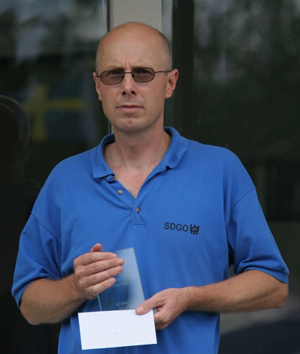 “The future for SDGO is uncertain, but there will be a worthy replacement with the new European Masters Major event.” says Jonas Löf, who has been part of the SDGO since the start in 1979 as a spectator, since 1980 as a player and most years from 1983 until 2013 as the TD or organizer. “I wish that the event will continue in some way.” says Jonas. Jonas Löf is the Vice-TD of European Masters 2014. Jonas has been involved with disc golf for almost 35 years and within the last couple of years he has lost some commitment and has stopped playing disc golf. Mainly due to some shoulder problems and the fact that the competitive instinct, that is necessary even for recreational rounds, is not there any more. Read more about the course and it’s history.